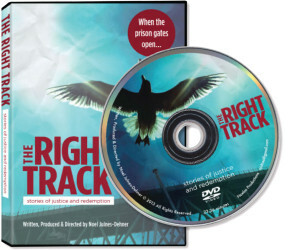 The Right Track: Stories of Justice and Redemption brings to life the situation of six ex-offenders who describe the wrenching circumstances that led to their crime and incarceration, turning points, and struggles and victories as they return to society. Seeking a way out of the pain of his violent alcoholic family situation, Ira turned to drugs, first to sell and then to use. Juandais went from Rent a Kid of the Year, to drugs and assaulting a police officer. Sheila chose to fight her abusive husband one night, shot and almost killed him. Doug fell off a mountain and became addicted to drugs he couldn’t afford. For a first-time nonviolent drug offense, Earl was sentenced to twenty years. Successful executive Tony felt scapegoated into pleading guilty to signing a false document about an environmental issue that concerned transitioning to new management at the company where he worked. Over 650,000 people in the U.S. are released from the trauma of incarceration each year, and they face hundreds of barriers to employment, education and housing. Nationally, 4 out of 10 end up imprisoned again. Through telling the stories of six returning citizens, The Right Track goes to the soul of the statistics and traces the challenging and surprising path of redemption. Broadcast on network television and shown to numerous civic organizations, The Right Track explores tension in the community and stimulates discussion about what needs to happen with citi- zens returning to society. To learn more about the film, go to The Right Track‘s website at http://therighttrackfilm.org.